Here it is Christmas Eve and my review randomizer has picked a Halloween book review for posting!Harriet and I read Harriet's Halloween Candy by Nancy Carlson a week before Halloween. What I didn't expect was how prophetic it would end up being.In the book, Harriet has a great haul during trick-or-treating and her little brother doesn't. Their mother insists that she has to share with her brother. At first she does it reluctantly until she nearly makes herself sick with them. Then she realizes she has far more than she could ever eat and decides to share them fairly with her brother.As it turns out, my Harriet found herself in a similar situation except with her big brother. They both went trick-or-treating for the first time this year. Sean though got too shy with all the crowds and decided to beg out of it after only two stops. So Harriet ended up with about ten times the amount of candy. At first she didn't want to share but by midway through November she decided, like the Harriet in the book, that sharing with her brother was a good idea after all. While this book does have a good moral to the story, which is important for kids to learn... I found the overall story/text to just be very shallow. This really isn't very memorable, and I'll therefore quickly forget I ever read this due to its lack of depth to the text and even the illustrations. After reading this book to my students I will introduce them to a giant bag full of items, (paper clips, unifix cubes, pencils, and erasers)I will also provide my students with individual bags and tell them to evenly sort the items in the large bag into the smaller individual bags. Once this task is completed I ask each student how many of each item they have in their bags. I would then provide them with another item and ask them where this item should go (this item will make the count uneven, and I want to hear their solution for this problem). After the activity we will discuss the book and how their experience related to the book. 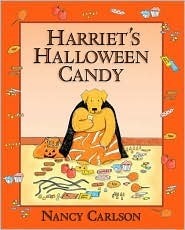 "Harriet's Halloween Candy," by Nancy Carlson, is a delightful story about greed that is suitable for emergent readers. Harriet goes trick-or-treating. On her return home, she assess her booty. Harriet concludes that she wants to eat all the candies, and not share any of them with her little brother. She eats so much candy that she turns green. Finally, feeling quite sick, she gives her little brother some candy. While her mother praises Harriet for her generosity, Harriet feels sick and guilty. The story I shared with our large crowd right before this one ended with a little boy showing off his HUGE Halloween candy haul. This provided the perfect closure. Harriet, like so many children do on Halloween upon arriving back home, dumped her candy out and sorted and counted it. She didn't want to share with her little brother, despite her mother's request that she share. The next day she hides the candy one place and another, til finally she decides the best solution is to eat it all. In the end she is happy to share with her brother, but dismayed when Mom calls them to supper. This is about Harriet who got a lot candy from trick -a -treat but she did not want to share them with her brother. She hid them in many different places until she finally decide to eat them. She started to eat them and then got sick from eating too much and then she decided to share. I used to LOVE Nancy Carlson back in the day. This is a good one about eating too much candy and not sharing. The classic! Harriet learns to share. And not to overindulge in Halloween goodies. This book makes me feel like a kid again.